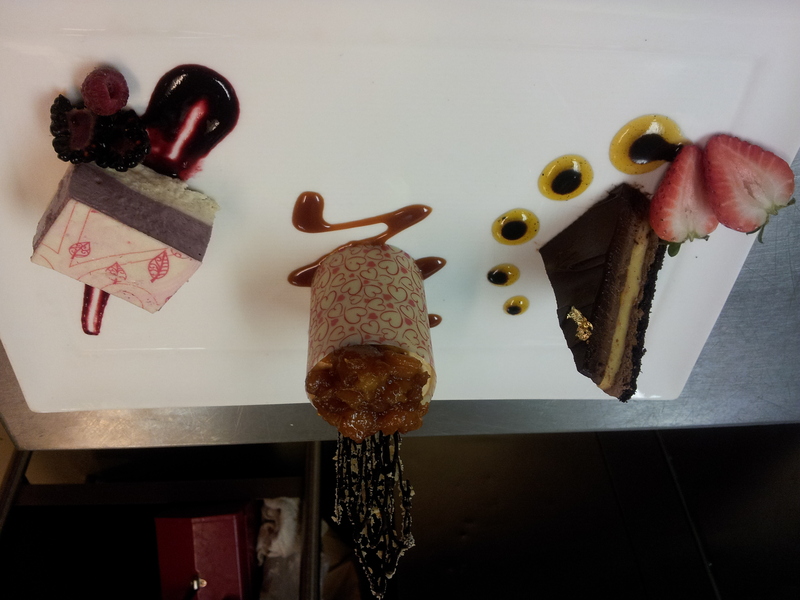 Something sweet to indulge in with your lover for Valentine’s Day at the Ojai Valley Inn and Spa – chef’s trio of love: Chocolate passionfruit crunch, banana rum cake and mixed berry mousse with fromage blanc creme. 2) Banana cake soaked in rum, banana pastry cream, caramel rum mousse, sauteed bananas, wrapped in white chocolate. Salted caramel sauce. Caramel mousse was interesting because i made a pate a bombe (egg yolks and simple syrup cooked over a bain marie to ribbon stage); then added caramel (dry method). Pretty yums.